1. When did you decide to get into politics and why? I have been an ecologist since forever. I read Rachel Carson’s “Silent Spring” somewhere in the nineties and got worried and angry. I voted green for a long, long time but decided to get actively involved in the party some twelve years ago, at first locally. In 2014 I was asked to be on the list for the elections to support the party, as I am a quite well known professor in Flanders, and I got the second place for the European elections. I campaigned very actively, together with Bart Staes, our MEP, and after the elections I got appointed by the party as a Senator. Through the Senate I am now also a member of the parliamentary assembly of the Council of Europe (mainly working on human rights, migration, social affairs, and the rule of law). Last October I was elected in the municipal council of my town. Why I am in politics? Because of the fact that I see how the world is going into a wrong direction. Climate change, environmental deterioration and social inequalities are big challenges we have to tackle. It is 5 to 12 and for most people it is business as usual. I feel the urge to do something about this and cannot help but fighting as hard as I can to make our world greener, more just and sustainable. 2. Do we need more young people in the European Parliament and why? What are you prepared to do on different levels regarding this? Of course. Young people are the future of our parties and should be represented in a significant way in the European Parliament. All member parties should put young people in prominent and eligible places on their lists. Lists should be representative of the demographic distribution and at least one in six candidates should be younger than 30. Our political project is all about the preservation of our planet for the future generations, and young people are these future generations, so it is only normal that they can participate in the decision-making processes. Besides, there are a lot of our concerns which especially affect young people, such as unemployment, poverty and access to education, housing and health care. Young people often are more vulnerable and need specific attention and therefore need to be involved in our political work (“nothing about us without us”). How to achieve higher representation of young people on election lists? By raising awareness at the level of national parties and giving more airplay to FYEG and its member parties. 3. Do you think your own party (on national level) is doing enough to ensure the representation of young people in European politics Why/why not? Our party is doing an effort, but this is not sufficient. In 2014 there were 3 members of Jong Groen on the European list of Groen (12 + 7 places), however these were not in strategic places. We need to ensure that in our 2019 elections on the European list, as well as on the lists of our federal and regional elections, we have young people in strategic places so they actually stand a chance to go to the parliaments. Nobody likes quota, but it is the only way to ensure equal representation on election lists. On the side, I am very pro the idea of giving voting rights to young people starting at the age of 16, as is in the program of our party for the regional, federal and European elections. 4. Can you name a few policy changes that you would work towards and advocate for that can improve living qualities and future perspectives of precarious youth in Europe? Social Europe: creating a true social Europe is important to fight poverty and exclusion. 50% of single-parent families and 1 in 3 young people in Europe are at risk of poverty. This is why we need adequate minimum income schemes, and improved access to education, housing and health care. Youth unemployment is still very high in Europe. I support the ideas we propose in our European Greens Manifesto (of which working group I was part) about the European Youth Guarantee and the European Solidarity Corps. The Corps as well as the Erasmus programs need sufficient funding so people from all backgrounds can have access to these programs. More in general: there should be youth mainstreaming of all EU legislation. We need to check in general that all policies in Europe do not negatively impact young people, but bring positive change. This is one of the reasons we need young people as part of the political process, but I also see it as my task to make sure policies work for all Europeans, specifically for those that face challenges, such as young people (but also elderly, disabled etc…). 5. What are the goals that you wish to accomplish as Spitzenkandidat or as an MEP in the next 5 years? As an ecologist, I believe climate change is the first and most important challenge for the next legislation (starting with the defossilisation of our energy mix), and also other environmental issues will be extremely important. I have been working on the environmental impact on health since many years (endocrine disruptors, plastics, particle dust etc…) and more generally work on the ecological (and social) impact of new technologies (GMOs etc…). This work I would like to continue in the EP. As an EGP delegate as well as in the parliament of the Council of Europe, I worked towards a more social Europe. This would be one of my main areas of focus. An adequate minimum income and decent jobs with good working conditions for all jobs, including new forms of work, relating to new technologies. Europe will be social or will not be. No economy that only favours multinationals! I want to continue my work to ensure sexual and reproductive health and rights everywhere in Europe, which I see as an important issue to empower young people, young women, but also men. This fits in my feminist as well as LGBTI agenda. Human rights, democracy and rule of law will also be very important subjects in the next 5 years, since maybe the survival of the EU will depend on it. We cannot accept that countries like Poland and Hungary violate our common values. They need to be protected by all our means. 6. Can you talk about one young politician that inspires you and why? I know a few. I will talk about young greens, because having great young politicians is really something green. The first one that comes to my mind is Ska Keller, she has impressed me ever since she became an MEP and continues to do so. However, since I am now kind of competing with her to be one of the Spitzenkandidaten, I will name two more that inspire me. Terry Reintke, whom I know as a fellow LGBTI-activist, inspires me because she combines talent and skills with an impressive political maturity. Her enthusiasm and creativity are always refreshing and I look forward to working with her (and Ska) in the European Parliament. Already at school I had a fascination for nature, the environment. When studying chemistry and environmental sciences I soon realised that I wanted to contribute to combating climate change not only through science, but in the international political arena too. The consequences of climate change are too serious to wait for the market itself to become sustainable. As a politician, I wanted to step up against the vested interests of the fossil energy industry, the car industry, the aviation industry. That is what I have been doing and I will continue this fight. Yes we need more young people in European politics. The European Parliament decides on laws that shape the future EU. The new generation has the best chances to break with old failed policies, which have left millions of Europeans without a fair chance to a good job, a healthy and fulfilling life. If it was up to young people, we would not have had a vote in favour of Brexit and we would have much more ambitious climate action. I will continue to listen to the voice and interests of young and future generations. 3. Do you think your own party (on national level) is doing enough to ensure the representation of young people in European politics? Why/why not? GroenLinks has a party leader who is 32 years old, which is a good indication of the opportunities my party gives to young people. But it is not just him: he managed, together with the movement we have built, to mobilise thousands of young people to participate in politics and vote for the very first time. I hope we can continue to do this in the European elections in order to strengthen the voice of young people. The lack of opportunities for young people is a result of years of failed right wing dogmas that liberalised labour markets, badly regulated financial markets, austerity and free trade would create wealth for everyone. In reality, it caused failing banks, unemployment, underfunded public services, inequality and in some parts of Europe a generation of young people who are worse off than their parents. We need to break these right wing dogmas, not by some social window-dressing, but by putting social justice at the heart of all European policies. By regulating markets, putting in place a proper investment plan and providing room for social protection, we can give young people the chances they deserve. First of all I would like to run a successful campaign to increase the number of green MEPs to fight for a different Europe, with elected MEPs from all parts of the EU. Together I want us greens to be a credible alternative to the old centre parties that have presented their policies as if no alternative was possible. I want us to show and proof to people that a different, a green and socially just EU, is possible without rejecting the incredibly valuable European cooperation that was constructed over the past decades. Alexandria Ocasio-Cortez is a very inspiring young politician. She shows that – even in these extremely troubling times in American politics – there is always hope to defeat politics of anger and fear. She offers hope that it is possible to win with progressive ideals. Ocasio-Cortez already announced her first point of action: work on a Green New Deal for the US. She is not just by herself, by the way, the new Democratic successes that took over the House of Representatives are the most diverse ever: representing all kinds of ethnic backgrounds, religions, genders and sexual orientations. For me it was always normal to be interested in what is happening around me and trying to change that. That is what politics is about, after all. I would say that this started in my early teens, when I got interested in animal welfare and later joined an anti-racist group in my hometown. I stumbled across the Greens pretty much by coincidence – there were no Green Party structures where I lived – and I knew right away that I had found my political home. That was in 2001 and since then I have been active in the young greens, including in FYEG of course, and later on in the Green Party. Definitely! While things have improved and the European Parliament is no longer a place to store politicians when the party does not know what to do with them at national level, the average MEP is older, male and white. However, a parliament needs to represent society! We need much more diversity in the Parliament and much more young people in politics in general. After all, what we decide today will affect young people much longer than old people. To achieve that aim we need youth organisations like FYEG where people are able to test their ideas, work on their skills and try new methods rather than just be assimilated into old-style politics. Parties need to be open and ready to change their ways as well as encourage their young members. We need young figures at the head of parties and lists to show that it can be done. Most importantly, we need to change the way politics is done to make it inclusive and open. The German Greens just voted their European list and it includes five candidates under 40 on the first 10 places. And of the total 40 places, 19 are under 40. 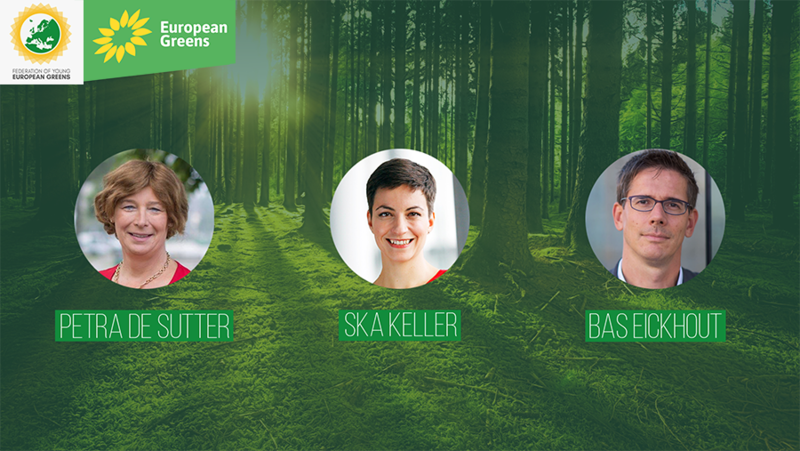 We also have three former FYEG spokespeople on the list and many who were or are involved in the German Young Greens. Also in our recent regional elections, we had young greens getting elected and breaking age records in the parliaments. Our head of list in Bavaria was too young for legally becoming prime minister. It is good we only came in second! 😉 On the other hand, this also shows that laws still have to be changed because there is really no reason for why a prime minister needs to be at least 40 years old. The reason for that involvement is surely that we have a strong young green organisation and that young people are encouraged to run and take responsibility. In general, all policies affect young people so we need to make sure to always include young people’s perspective in whatever we do. More specifically, we need to address the social situation of young people, so they don’t walk from education into unemployment or exploitative internships or precarious jobs, as is, unfortunately, very often the case. Member states need to implement the youth guarantee to ensure good jobs for young people and internships need to be regulated. We Greens have always advocated that Erasmus should be an opportunity for all and not just for students or for those who are better off. Now we need to make sure that Erasmus+ is indeed becoming a reality for all. For me, youth participation is a crucial issue. Young people need to be heard and be able to speak up for their interests. There are three big challenges that we urgently need to tackle: Firstly, climate change and the loss of biodiversity. We have a small window to act before we face a climate disaster. It depends now on the political will to do it. One testing ground for this is the climate summit in Katowice. The European Union needs to show real leadership there. The other testing ground is the Council: Will member states be ready to go along with the more ambitious targets of the European Parliament, for example on car emissions? For that, we need political pressure. Secondly, we need to build a social Europe. The European Union has too long been focused on economic rules and markets – also because member states do not want common efforts in the social sphere. We finally need to put social goals on the same footing as economic rules and therefore binding minimum standards for income and health care all over Europe. Thirdly, the European Union needs to be able to defend democracy and rule of law all over Europe. Those fundamental principles are under attack in several member states and the citizens are rightfully looking to the EU to protect their rights. We need to develop instruments for safeguarding those rights. Greta Thunberg. I find her very inspiring because she just decided on her own, without planning or organisation, to do something brave: going on a school strike for the climate. She did not know where this would lead and was ready to risk disadvantages for herself. She reminds us that it is really up to everyone to make our voices heard and to take action against the climate catastrophe. Tagged bas eickhout, interview, Petra de Sutter, Ska Keller, spitzenkandidaten. Bookmark the permalink.